Each One Bedroom Plus Loft unit at the Village Inn offers an efficient mountain lodging experience designed primarily for individuals, couples, and small families ready to snuggle up at the end of a great day outdoors. The space is cozy like a studio unit with the addition of a small bedroom and stairway-accessed full-height loft. 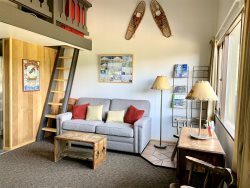 This One Bedroom Plus Loft unit includes a living area, small bedroom, full-height loft, kitchenette, TV, 2 bathrooms (one with shower and one with tub/shower), small balcony, and exterior storage for skis. Kitchenettes have appliances and basic cookware, serving ware, and utensils. Unit 130 is located on the second floor, accessed by stairs only. The unit's main window offers a southern view toward the White Pass alpine ski area and beyond.